Bassam Tibi is Professor emeritus of International Relations. Until his retirement in 2009, he taught at the University of Goettingen (Germany) while also holding various affiliations at Cornell University among others (see vita). Tibi is the founder of Islamology as a social-scientific study of Islam and conflict in post-bipolar politics. He is the author of 41 books of which 11 were written in English. Prof. Tibi gives presentations and lectures on the various topics of his academic career: Islam and Islamism, the Middle East or the Arab Spring. Thank you for visiting my 2015-updated website. This gratitude is associated with the hope that you are willing to read a text that is much longer than a short one that reflects a shallow Twitter-/ Facebook-communication style. This is a warm welcome and a thank you for your attention. Between the time of the earlier draft of the welcome letter to this homepage, written in 2012, and this one of the year 2015 many things happened and my life changed. The basic change in this updated draft is the venture of the fully new design that covers my professional life and academic accomplishment, as well as the concepts and approaches introduced in my work. I repeat that this comprehensive curriculum vitae runs counter to the new culture of sound-bite communication. In this new text I outline my life and my work to date as well as the nature of updating this English part of the present homepage/ website. At first, I am most grateful to my friend and colleague Dr. Roland Hiemann for the great work he has done for designing this homepage and to my friend Dr. Thorsten Hasche for his assistance in updating it. In fact, this website is a great accomplishment of Dr. Hiemann for which I owe him endlessly a deep gratitude. Let me start in deviating from the soundbite-fashion of the prevailing pattern of the electronic communication from which I have dissociated my work, as stated above. I am committed to substance in this way of writing an introductory long text. After a rich academic career of forty years documented in the comprehensive English curriculum vitae you find below I decided to withdraw ending this career in 2012 along with the publication by Yale University Press of my seminal book Islamism and Islam. I use the term “seminal” because Oxford dictionary gives this meaning to this word: “giving rise to new developments, seminal ideas”. In the preface I express the hope that this Yale book gives rise to a serious debate that goes beyond current postmodern fashionable ways of dealing with the religion of Islam. Postmodern Westerners impose their own views on the religion of Islam and the political ideology of Islamism as religionized politics. 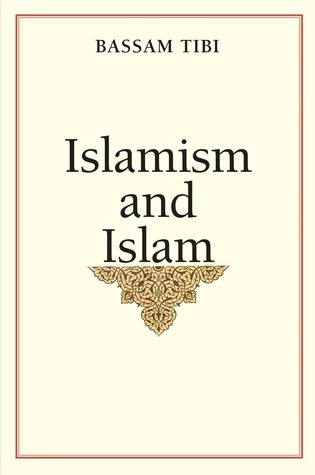 Formulas such as “radical Islam” as well as the opposed one of “post-Islamism” are not useful terms because they distract from the pending matter that is – again according to Oxford dictionary – turn away attention and prevent concentration on the matter itself in derailing the study from the course due. My academic career began 1970 after the completion of my PhD on Arab Nationalism. My work was continued later on with a focus on development studies in particular the role of modern military elites in the process of modernization. That was the subject-matter of my second PhD (German Habilitation, Dr. habil) published in German in 1973 by Suhrkamp. Ever since, that is from 1980 to date the focus of my thinking shifted towards the study of religion in society and politics. In this context I coined the term “religionized politics” in a process of identification of what is Islamism is all about. I furthermore established in three book trilogies Islamology as the social-scientific study of Islam and Islamism (see German Wikipedia “Islamologie”). After thirty-five years of research and publication I had to face the sad fact that my new approach failed to become an established school of thought due to sidelining my work by the prevailing narrative. In my 2013-article published in the US journal Soundings (editor Prof. John Kelsay) I complained about this sidelining of my work by the prevailing narrative. One only acknowledges my first book in English of 1980 Arab Nationalism (hence 3 edition, the latest 1987) and deliberately overlooks all what I have published on Islam and Islamism ever since. The reason for this is that my thoughts are not in line with the prevailing narrative. I also dealt with the issue in my jointly with Dr. Thorsten Hasche written contribution to the book of Erich Kolig: Freedom of Speech and Islam (Ashagte 2014). Next to the hope expressed in my Yale-book cited above, namely that it “will spark a fruitful and enlightened debate” (Preface, p. x) I also announced there that I end my career and leave the stage. In fact that book was completed at Yale University 2008/09 and submitted 2009. That period was supposed to be one that heralds my academic farewell. However, the peer-reviewing of the book took an unexpected heavy toll. It lasted 3 years. To establish a sound judgment under conditions of disagreement the book underwent from its early draft in 2008 on four rounds of reviewing that included twelve professors. The publication of the book in 2012 happened after undertaking a great deal of revisions and compromises in a process of endless rewritings. I was ready to compromise, but I did not take away the phrase in the preface written 2009 in which I state that I am leaving the stage. Unexpectedly, and parallel of the going to press of that book came Arab Spring 2011. That sign of hope turned, however, into an unpleasant summer and ended in a lethal winter with the violence of Islamist movements. Starting with the dreadful and monstrous winter of 2011/12 a fight between jihadist Islamists (ISIS) and dictators seems to end the hopes of Arab-Muslims committed to democracy. Under those conditions I could not keep silent. Therefore I returned to the stage in a first step in writing 2012/13 my eleventh book in English: The Shari’a-State. Arab Spring and Democratization (see book section). Hereafter I completed 2014 the new enhanced and revised edition of my 2008-book Political Islam, World Politics and Europe. In a drive to open a space for Islamist movements and despite my well founded rejection of their undemocratic ideology, I changed the subtitle from: Democratic Peace and Euro-Islam vs. Global Jihad to: From jihadist to institutional Islamism (Routledge 2014). Next to opening that space in a mindset of inclusion and engagement I examine in the new two chapters the assumption of moderation that characterizes the prevailing narrative that sidelines my approach of Islamology outlined above. Those supporters of the narrative in point who mention my work accuse me of essentialism and Islamophobia. Attentive readers know however that the study of change is central to my work that is based on the enlightened Muslim thought of which I am a follower. It is a shame to see enlightened Muslims being defamed in this manner. This new year 2015 began with unpleasant events reaching from the violence of jihadism in the Middle East (ISIS) and Africa (Boko Haram) to the execution of European journalists in France in an effort at limiting the basic right to a freedom of expression. In this heated atmosphere sound writing needs to keep the balance between critical analysis of the existing conflict on the one hand, and intercivilizational bridging, on the other. No such balance can be reached by policing speech and writing on Islam and its civilization as well as the setback by Islamism. Already in 2012 the publication of my collection of unpublished essays I voiced this need in the title of my book Islam in Global Politics. Conflict and Cross-Civilizational Bridging (Routledge 2012). Above all we need to maintain the freedom of speech, as I argue in the final chapter to my book of 2013 on Arab Spring. No serious observer can overlook the increasing prejudice against Islam and Muslims. To combat this resentment and to counter Xenophobia we need, however, a sincere dialogue and true enlightenment, not censorship and policing. There should be no policing of speech. My colleague Prof. Erich Kolig addressed this pertinent issue in his edited volume: Freedom of Speech and Islam (Ashgate 2014). My German colleague Dr. Thorsten Hasche and myself are lucky to be among the contributors to this important volume. We, Thorsten and I, wrote the chapter “The Instrumental Accusation of Islamophobia and Heresy as a Strategy of Curtailing the Freedom of Speech (Chap. 8, pp. 187-208) for Kolig’s volume. Not only Islamists engage in such accusations to prevent criticism of their action, but also some Western scholars of the prevailing narrative. They confuse respect for Islam with outlawing the critique of Islamism. I hope this introductory letter to my homepage encourages a serious reading of my work (see book-section) to see that I criticize from the point of view of the enlightened Muslim thought and thoroughly combat prejudice. Islamism and Islam, New Haven: Yale University Press 2012. Tibi’s latest publication in an US-journal is a conclusive article trilogy on Islamism/Political Islam published in: Soundings. An Interdisciplinary Journal (Pensylvania State University Press) in: Vol. 95 (2012), vol. 96 (2013) and vol. 98 (2015). In Soundings: An Interdisciplinary Journal (Vol 96, 2013, No. 4, pp. 431-449), published by Pennsylvania State University Press, Tibi lays out his fundamental critique of the dominating narrative in Western Islamic Studies. Prof. Tibi gave a lecture on the Middle East uprisings at Christian Solidarity International (CSI) in Zurich, Switzerland on 19 Nov. 2013. Bassam Tibi’s new book has been published by Routledge. 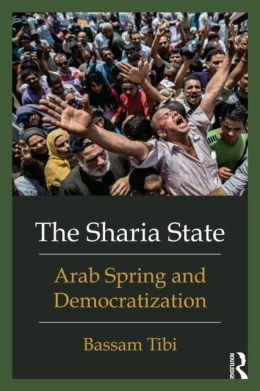 For more information see the book description or the editors website: The Sharia State: Arab Spring and Democratization (Paperback) – Routledge.